We will hold “Recreational Day” at the Bucky Dome site near the corner of 51 and Grand on Friday, Dec 9th from 12pm-2pm. On Thursday, Dec 8th from 12-1pm we will be marching at the Federal Building in downtown Carbondale. Please join us! There will be a special Human Rights peace vigil at the Town Square on Saturday, Dec 10th from 12pm-1pm. The Peace Coalition is calling for 30+ people to hold signs stating the Universal Declaration of Human Rights. This Saturday, Dec 10th, following the GA, at 2:30pm there will be a teach-in on sewing/mending clothing. Bring clothes in need of care. American Voices meets every 1st Thursday of each month at 6pm at Spinoni’s. This is a good opportunity for outreach. Ashley is planning an Art Show for next Wednesday, Dec 14th following the GA.
Last Sunday’s live music show made $20 for IMC utilities. The Sierra Club is having a picnic at Giant City on New Year’s Day at Shelter 2 from 11-3pm. It is a potlatch. There will be soup. PROPOSAL: Add a general discussion session of approximately 20 minutes to the GA agenda so that meetings will proceed as follows: 1) Announcements, 2) Discussion, 3) Proposals, 4) Adjournment. PROPOSAL: Change the consensus process to include a discussion of the proposal after clarifying questions and before the first vote. Note: Since this proposal concerns the scheduling of GAs, it must be brought up and passed at another GA.
(following the discussion) the process goes straight to small group discussions. Note: Since this proposal concerns the structure of GAs, it must be brought up and passed at another GA.
A general discussion session of approximately 20 minutes will be added to the agenda of the General Assemblies so that meetings will proceed as follows: 1) Announcements 2) Discussion 3) Proposals 4) Adjournment. The consensus process will now include a discussion of the proposal after clarifying questions and before the first vote. 1. Cancel the General Assemblies currently scheduled for Dec. 24th, 2011 and Dec. 31st, 2011. 2. Eliminate the first “Intervention” step and the vote that follows it from the consensus process so that if a proposal is blocked in the first vote (following the discussion) the process goes straight to small group discussions. Marleen Shepherd made an announcement on behalf of the Carbondale Interfaith Council. They would like us to know that they (along with other organizations) are currently drafting a statement of suport for the Occupy movement. They support Occupy Carbondale and are looking to help us. 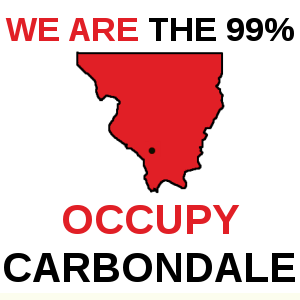 Occupy Carbondale has been invited to speak at the Carbondale Human Relations Commission meeting Monday, Dec. 5th at 6pm at the Carbondale Civic Center. Several occupiers will be in attendance. Everyone is invited and encouraged to participate. For anyone who wants should join the Occupy Carbondale google group, a piece of paper is being passed around to collect addresses. Jason Shoot is running for WDBX Board of Directors. Become a WDBX member, and you will able to vote in the election. The Alternative Gift Fair will be held at the Unitarian Fellowship from 3-6pm on Sunday, Dec. 3rd. 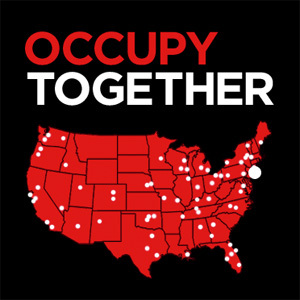 Anyone interested in Occupy Chicago’s meet and greet networking efforts can talk to/message Ashley. 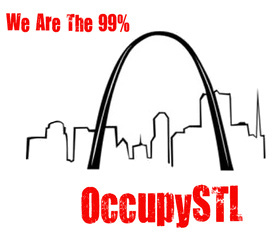 There will be live music at the Occupy HQ (IMC 214 N. Washington) on Sunday, Dec. 3rd (late evening?). Proceeds from donations will go to pay for our facilities and a portion to the bands. Peace Coalition need at least 32 people to attend next Saturday, Dec. 10th for a special Human Right’s Day peace vigil to hold signs featuring the declaration of human of rights from 12pm-1pm at the Town Square. Occupy Carbondale will be demonstrating against austerity measures, corporate influence in government, and tax laws that favor corporations outside the Paul Simon Federal Building in Carbondale on Thursday between 12-1pm. Please join us! Discussion: While there was considerable support for the idea following the intervention stage of the consensus process, the proposer withdrew the proposal. People should be aware that we likely will not have a permit to demonstrate on Federal property, but are protected when demonstrating while walking in the sidewalk areas. Anyone is welcome to get a permit for the demonstration. The 7th annual Alternative Gift Fair will be held next Sunday, Dec 4th from 3-6 pm. There will be an art exhibit and demonstration focusing on Art therapy, “Art as Empowerment,” at the Women’s Center on Wednesday, Dec 1st at 7 pm. A copy of a video of Occupy Carbondale members speaking at the New Humanist Forum has been given as a gift to the Media Committee. A teach-in called, “In defense of the Public Sector,” is tentatively scheduled for Thurs, Dec 2nd at 7 pm at the Carbondale Civic Center. A calendar is up and running on the google groups. Keep an eye out for it on the website! PROPOSAL: Give Peter autonomy to accept invitation from OccupyTogether.org and OccupyWallSt.org to participate in online radio station. This does not include any power over content or scheduling. PROPOSAL: Share a communique from a teacher in Oakland, CA on the Google Group. Discussion: Facilitator clarified that this did not need to be a proposal. Peter may communicate with OccupyTogether.org and OccupyWallSt.org in order to accept their invitation to participate in an online radio station on behalf of Occupy Carbondale. Discussion: Facilitator stated that this did not require a vote. PROPOSAL: Have a press conference to inform the public about our happenings. Discussion: Facilitator suggested an amendment to state that a future press conference would be authorized by the Media Committee. Then it was amended to prepare and do work for a future press conference, which does not require a vote at this time. PROPOSAL: Give the Recreation Committee the freedom to put the Occupy Carbondale name on promotions with the ability for Occupy members to vote against the name being used for each specific Rec Comm event promotion. Discussion: Facilitator clarified that is it always okay for committees’ to use Occupy Carbondale name for promotions. autodidactic learning, and possibly even create publications. PROPOSAL: Reduce the amount of Committees and set a fixed number. Discussion: We should be mindful of the number of committees in the future. We had a discussion after the GA about Committees versus Working Groups. A Committee is USED TO ACHIEVE GOALS, it is NOT a social group. Practical achievement is important.